The HF Radar facility provides real-time surface current data in the Ibiza Channel. If you are interested in the technical details of functioning of the HF Radar instrument, read general information or access to the presentation at the HF Radar National Meeting. All HF Radar Data has passed a battery of tests to ensure that the data being produced is of the highest quality and therefore, a QC flag can be displayed. Data can be downloaded in KMZ or NetCDF format. For a wider and more complete functionality use Lw4nc2 application. In this map, the latest currents available are represented (by its direction and speed value). Use the player and the time slider to check out the currents for previous observations (last three months are available in this viewer). Active additional layers (velocity components, magnitude or QC status flags) using the layer controls located at the top right corner. Double click on any point of the map to get a time-series plot in that point for each one of the selected parameters. Automatic data processing reports are generated on a monthly basis in order to extract useful and meaningful information from HF radar data and system performance. Access to all monthly reports available since September 2013 up to now. 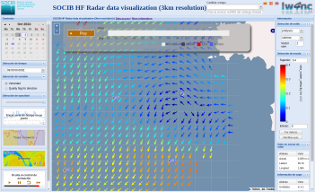 Lw4nc2 is a web based client application, developed by the SOCIB Data Center, intended to display gridded data from SOCIB, both, observational and forecasting. This application is still under development. This data output should not be used for navigational purposes. It's been released for limited public use with appropiate caution. For near real-time data only limited quality controls are performed. Timely delivery of data and products is not guaranteed.